Top: Maroon Crinkle Chiffon. An exceptional bridal shirt decked with chic and beautiful embellishments on bodice (front & back), shoulders, front borders and hemline (front & back). Abundant sequins spray all over the front and back. Rich detailed embellishments on sleeves. Sweet-heart neckline. Long slit on front with high low hem. Complimented with raw silk undertop and pouch. Lining inside. Concealed back zip closure. Bottom: Maroon Banarasi Crinkle Chiffon. 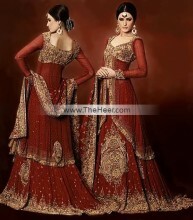 Astonishingly beautiful flared lehenga features exquisite embellishments on front, hem and all over. Big size ornamental motif in random design embellished on front and back. Abundant sequins spray all over the front and back. Concealed side zip fastening. Dupatta/Veil: Maroon Banarasi Crinkle Chiffon. Heavy and intricate embellishments on borders looks sensuous. Small size ornamental motifs are made throughout along with heavy sequins spray. Embellishment work made with Sequins, beads, dabka, resham and Swarovski crystals. 100% pure highest quality imported fabrics. Click the button below to add the BW6397 Maroon Banarasi Crinkle Chiffon Lehnga to your wish list.